My sister and I were dressed for bed when we got the news that our dad was going to move out for a while. It’s not the kind of conversation a ten-year-old expects to have, especially in the evening; earlier in the day, maybe, when there is still time to become distracted by television or playtime, but at bedtime, there would be nothing to distract. In my world, 9pm meant shadows, darkness and silence. My mother came into our bedroom, sat us down on the floor at the foot of my bed, and explained what was happening. “But why,” is the question I wanted to ask, or think I should have wanted to ask; what came out of my mouth was nothing. Maybe I was too afraid to ask. Maybe the answer had something to do with the disarray of my room, or how I almost always argued when they asked me to wash the dishes. As a kid, I had enough problems getting myself into trouble without actually inviting someone to pin the blame on me or to point their finger my way, so, no, I didn’t ask. My mom put her arms around us, urging us to join her in reciting The Lord’s Prayer. I felt ridiculous and helpless, sitting stiffly while she tried to pull me close, chanting a memorized verse I barely knew and understood even less, while he was in the other room gathering his things. It was like we were waiting for some huge disaster to bring about the end of the world, nothing left to do but pray and wait, hoping it will end quickly – instant incineration or obliteration. I sometimes liken it to the last moments of life, when a person realizes that any attempt to avoid the inevitable, to struggle or fight, will be futile, and so you stand and greet fate with an outstretched hand. Our prayer didn’t seem to be summoning up any sort of divine intervention, and we were just sitting there, letting him leave. In my pink and white flannel nightgown, I pulled free and abandoned the vigil to follow him out to his truck, crying and pleading with him, “Please don’t go, Daddy.” As I stood under the lamp post begging for mercy from this man who couldn’t possibly want to leave, he told me, very simply, to go back in the house. As I continued, he looked down at me with a straight face and laughed (which is also now an attribute of mine – laughing at inappropriate times), having no explanation for me and obviously not knowing what to say, and instead told me again to go back in the house. This was not the same man who used to dance through the house singing crazy songs like “Yes, we have no bananas,” or the man whom I thought invented the song “Tutti Fruitty.” He taught a Sunday school class and played his guitar for mesmerized 5-year-olds who hung on his every note. 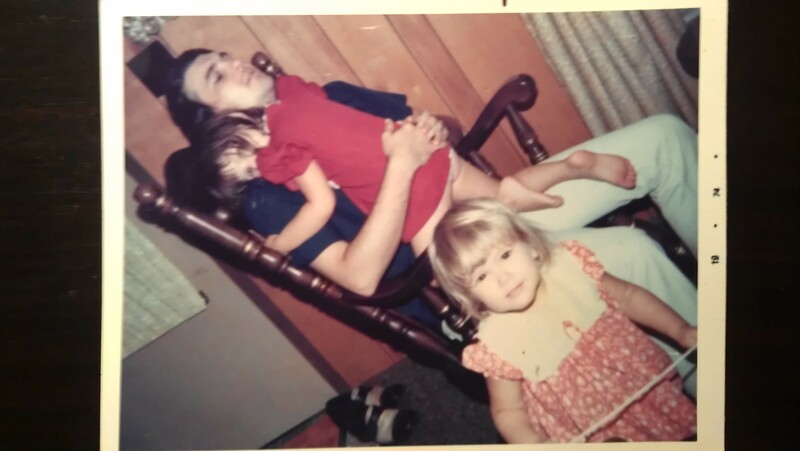 When my sister and I had spend-the-night parties, our friends would pile into my dad’s lap because he was handsome and kind, but silly too. But that man didn’t live here anymore. He had become the man who would visit the house in the following months to repair things that had broken in his absence, working quietly as I stood by watching, and wondering what could be making him so sad. The time of year usually escapes me in my memory of that night – in my bedclothes standing under the lamp post with bare feet that didn’t seem cold on the glazed brick sidewalk. It could have been cold, but in Alabama, sometimes we wear shorts on Christmas, and it was Christmastime. I woke up that morning with the usual anticipation of discovering tidily-wrapped treasures peeking out from under the tree. But before I had even thrown the covers back, the realization came crashing down on me that there was going to be no dad on the sofa. Not today. Today there would only be mom on the loveseat. I lay there silently, pinned under the weight of a thousand memories from Christmases past – my silly, wide-eyed dad warning that the wrapped gift I held in my hands was an inflatable elephant or a Doberman that would burst from the box as soon as I had broken that last piece of tape. There would be no jokes from the peanut gallery today. No sir. No loving father smiling gently from the sofa as my sister and I took turns opening presents, showing each around the room proudly, even if one turned out to be just a shirt. While it’s true that a lot of kids spend a lot of holidays with only one parent, I know from experience that for those old enough to feel the absence, it’s that first one that really stings. The first one was my only one, but I remember it well. Over the months just preceding my dad’s departure, my parents had been spending a great deal of time together, and I was jealous. They had always been close, but nearer to that break, they had seemed almost inseparable – spending time together, but not with us. Of course I now realize what was happening, and that what I had perceived then as neglect was probably them trying to work through whatever problem they were having. I remember looking out the sliding glass door (the one I had run through three years before, causing 56 stitches and five big scars to my legs but no serious damage), and seeing them holding hands, walking through the yard. I scowled as they strolled along, looking at each other and then away, smiling at each other and at the ground too. I wanted that attention. When our gifts were open that morning and the stillness had returned, my mother told us that we were going to see our dad. My sister said, “Okay,” and shrugged as usual. Everything was okay with her those days. I said, “No, I’m not going,” even though I knew that I didn’t have a vote and it didn’t matter what I said. We were going. He was staying with his mother, who lived about an hour away. My sister and I had gotten identical porcelain dolls (hers in a pink dress, mine in blue), a few things insignificant to a childhood memory, and a miniature Frogger video game to share. We always got the same gifts, just in a different color, since we were only a year apart. I had called the front seat, and I sat playing my new video game, not caring whether that frog lived or died, until the batteries ran out about halfway to Grandma’s house. I spent the rest of the ride glaring at the countryside I usually enjoyed. I was mad for having to go see him when he didn’t have the courtesy to be there on Christmas day. My mom’s gift for him seemed appropriate, but a little untimely, considering that he had already moved so he didn’t really need a suitcase. My grandmother greeted us at the door, and as she hugged me I saw my dad behind her sitting on the couch. I walked over reluctantly and hugged him, and was surprised to find that I was glad I came. Yes, I was still hurt that he hadn’t come home, but it was good to see him and know that he still loved me. I would have never predicted this at the time, but the four months or so that followed were some of the best times we ever spent together. My wish had come true, just not exactly how I might have imagined it would. One Friday night, he picked my sister and me up just before sunset, and we went camping at the fire tower. We had all gone there before as a family, but it seemed more exciting with just us three. My mom was usually the sensible counter to my dad’s daring. At times, he seemed more like a fun uncle than a dad, but that could have been simply because he didn’t like to punish us. This was our first trip to the tower after dark. The drive always seemed to take hours, and once we turned off the highway, the dirt road went on for miles and miles, leading us high up the mountainside in some remote part of Alabama where no one except for the park rangers dared to go. At last, the headlights illuminated the tower’s metal-frame base, and we were there. We used our flashlights to explore for a while, talked about what kinds of animals could be making those strange noises, and then picked up a few hickory sticks to add flavor to our charcoal fire. When the fire was ready and our stomachs were churning in anticipation of the steaks we brought, my dad realized he had forgotten the cooking grate. After nearly thirty years, I still have this scene in my mind, as clear as if it were just yesterday: my dad is lying on the ground, first on his belly and then on his side with his arms outstretched and his face turned away from the heat of the fire; he holds the steaks one at a time over the flames with a pair of tongs; he is grimacing with silly faces and laughing as he pulls his hands away from the flames when his knuckles get too hot. I can also still remember the taste of those steaks, and don’t think I will ever have another one that tastes as good, or is that rare. When dinner was finished and our bellies full and bulging from the rare meat, it was time to turn in for the night; I thought perhaps we’d sleep in the bed of the truck, but it was a little cold for that without shelter. My dad told us that we were going to stay inside the fire tower, and it was a long climb up. I had always chickened out before getting to the top, but this night, there was no climbing back down. The ascent wasn’t so bad in the dark since I couldn’t see the ground, but mostly, I made it to the top because I didn’t want to be alone with whatever creatures might be lurking just beyond the narrow beam of my flashlight. The night was cold and windy, so my dad wrapped plastic around the outside of the broken windows; he managed to replace the chilling bite of the wind with an equally troubling howl, but I felt secure with my dad in the next sleeping bag. I was pretty sure there weren’t a whole lot of people (or things) brave enough to climb all the way to that post, especially at night, but I also knew that no one or thing would dare threaten us with my dad around. The next morning, after a bit of hiking and peering over the familiar edge of Bald Rock, my dad let my sister and me take turns driving on the dirt road on the way back to the highway. We stopped along the way for a round of target practice with his .22 rifle and a few discarded drink cans we gathered from the roadside, and I turned out to be a pretty good shot. When my dad dropped us off at home, I once again stood on the sidewalk and watched him drive away, but it wasn’t as hard this time. He had won my heart all over again, and I knew that he would miss me just like I would miss him. He was, once again, the man who had always been the center of attention at my sleepovers and birthday parties, and who would once again play his guitar and serenade me with a love ballade I’d heard on the radio. Several months after our expedition to the fire tower, he came for a visit. My sister and I, of course, were sent off to play so that they could talk. After a while, he called us into the living room. My mom was sitting on the couch, and he was lying with his head in her lap. He looked up at us, was quiet for a minute, and then asked if it was okay with us if he came back home. I tried to look as if I had to give it some thought, but my poker face failed me. I smiled and said that it was. He didn’t stay for good. Not that time, anyway. The thing is, he moved out a second time, but I don’t remember when it was that he left. I didn’t follow him down the sidewalk in the moonlight or ask him to stay. I just kissed him on the cheek and told him I loved him. Letting him leave was easier, because I knew he would always come back, if only for me. ← Back Off Northerners, It Wasn’t Just Snow! Thanks, Tom! I’m glad you liked it, and more glad that you told me so. I appreciate the good feedback. Hi TeddyLee01. Thank you for reading and leaving a comment. This one is obviously close to my heart. I’m glad you liked it. Thanks, Teddy, and welcome to my humble blog. I hope you find something else that you like. I started reading through some of your posts last night but haven’t had a chance to comment yet. I look forward to reading more. It would be heartbreaking enough to have my father leave once, but multiple times might have done me in. I am glad he returned though. You are a good writer, Karen! Hi Cheryl,Thanks for reading and for the nice compliment. It was a tough time for all of us. Writing about it (much later) really helped me. Karen, this is beautifully written and full of genuine emotion. Your dad gave you a gift through his pain by letting you know he loved you no matter what. So many kids feel responsible for their patents’ problems but you didn’t seem to. I hope your life is good now and that you still know you are loved! Hi Anne, Thanks for reading, and for the wonderful comment. Yes, many years have passed, and absolutely, I am loved. Thank you! I am so glad. . . . thanks for sharing and encouraging others. The Mouth of Truth Beckons. Just click the button to answer its call. If you aren't a blogger, you can get updates about my new posts by email. Enter your eMail address, then click the button below, but only if you can handle the truth. These blogs are pretty good too. You should check them out. The contents of this page belong to me. Please feel free to re-blog or share my work, as long as it is credited to me. All photographs are also my property unless I have specified otherwise. I don't think I'm better than you. It's common knowledge. Hi all. My name is Jeffrey. My sci-fi novel Hope 239 is now available direct from Wido Publishing, it is also on Amazon or you can order it from your local bookstore. I'm a writer of many genres and subjects. Feel free to click on a category and peek around. Zombies in Promised Land Abanoned. Thoughts on writing in the WIMTMs. And other fiction, science-fiction, horror, and various non-fiction. I read a lot and I like to write about what I read. I'm also in the process of starting a new blog page/website called "Poets of the Dead Society" which will be a home for zompoc, apoc, post-apoc, and other works dealing with the roaming dead and worlds which have become dead.